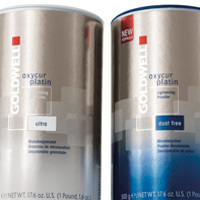 Decolorizing powder that meets all the needs of bleaching and discoloration, from light blond highlights the extreme. Gentle to the hair. With mild anti- yellow, Whitener lightens up to 7 levels due to improved consistency and the formula Platin -Plus. The cationic polymers treating give the maximum protection, treatment and combing. Decolorante high performance, comes in granular and white, delicate and controlled for lightening up to seven levels. It contains no ammonia persulfate.